Photoshopping different effects onto a one dollar bill can be fun. 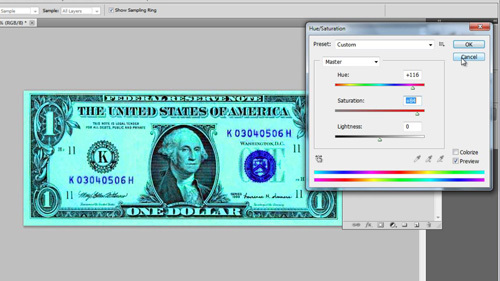 In this tutorial you are going to learn how to photoshop dollar bill. You will need to have an image of a dollar bill available and have this open in Photoshop. One of the easiest changes you can make to the bill is to its color. Click “Image” in the main toolbar, navigate to “Adjustments” and click on “Hue/Saturation”. Use the top two sliders to change the color of the whole bill, when you have a color you like, click “OK”. Here we’ll show you other effects, so we will not apply these color changes. Photoshop has several artistic filters which can be fun to apply when learning how to photoshop dollar bill. Click on “Filter” in the main menu, navigate to “Stylize” and select “Glowing Edges”, this will be one of the more interesting effects to apply to your dollar bill. Use the three sliders on the right to find some good looking settings – here an “Edge Width” of “2”, an “Edge Brightness” of “6” and a “Smoothness” setting of “5” give it an interesting look. Click “OK” to apply the settings. 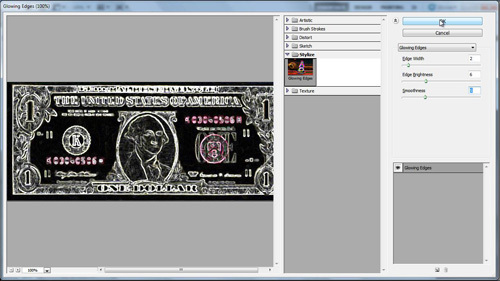 These are just two of the many interesting effects you could use in Photoshop to edit a dollar bill.